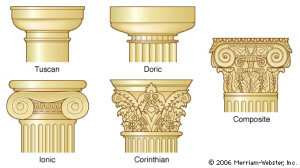 The Classical Composite Order was developed in Rome and , as its name suggests, is the result of a composition of Ionic and Corinthian Orders. In the Composite column capital there is a combination of Ionic volutes and Corinthian acanthus leaves. 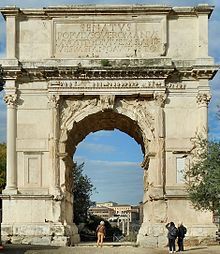 The significance of the Composite Order is connected to the notion held by the Romans of “conquering glory” , simply because many triumphal arches showcased Composite Columns. This order can be directly correlate to both Roman victory and humiliation of the defeated, and many Renaissance authors associated this order with the female goddess, Victoria, who was a winged figure holding a victor’s wreath for crowning the emperor. 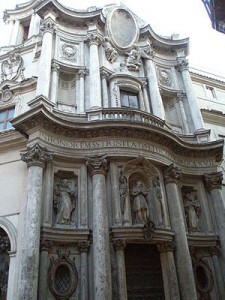 The major Renaissance treatises, including Serlio’s, Vignola’s, Palladio’s, and Scamozzi’s have defined and illustrated the Composite as a distinct order, resulting in the five orders of architecture. Not all have agreed on its name: it has been called Italian, Roman, and Latin, to distinguish it from any Greek origin. Capitals with acanthus leaves with big scrolls; its entablature shows an ostentatiously sculpted frieze and cornice. 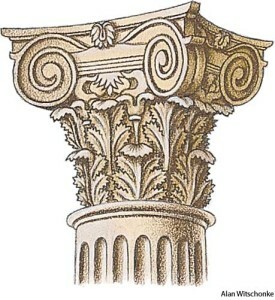 The volutes of the Ionic capital were adapted from Phoenician and Egyptian capital designs. They are large and some ornament is generally placed between the volutes. The order determines the shape, proportion and decoration of the basic architectural elements: the vertical, supporting column (with its base, shaft and capital) and the horizontal, supported entablature. Entablatures are the tallest of all the orders (2 diameters high); From the bottom to the top, it presents: the architrave, the frieze and the cornice. Composite decoration reflects a sense of triumph; it was used to represent victory, prestige, opulence and success. Scholars of ancient classical architecture generally agree that the earliest surviving example of the Composite order exists on the Arch of Titus (81 A.D) in Rome. However, it is impossible to say if this was the first use of the order. 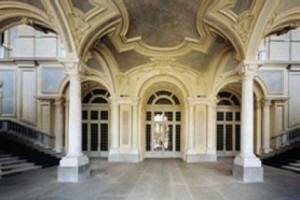 Palazzo Madama, Turin– It is a large historic building, which owes its name to the resident widows of the 17th century dukes of Savoy. Used by the Sardinian Senate in 1848–60 and by the Italian Senate in 1861–64. It’s today houses the Museum of Ancient Arts. Despite its name, it is a large collection of paintings, statues, church ornaments, porcelain, and decorative art, mostly from the late Middle Ages to the 18th century. 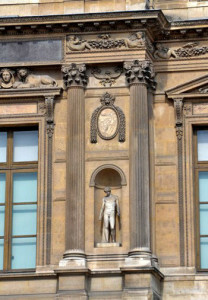 The Lescot wing in the courtyard of the Louvre palace (Paris, France) is the oldest part of the existing complex. The Wing was executed between 1546 and 1551 by the architect Pierre Lescot. Strongly tinged with Italian Mannerism, it became the Parisian Renaissance style.